A heartwarming memoir by the Jack Russell Terrier that starred in The Artist and Water for Elephants. Uggie’s memoir offers readers the true rags-to-riches tale of one ordinary Jack Russell Terrier who made it big in Hollywood. For the first time, Uggie tells his story of rising from humble beginnings as an abandoned shelter dog to being adopted by esteemed trainer Omar Von Muller. Uggie details his time starring in commercials for everything from Kia cars to Bud Light. Uggie eventually broke into the film world with his appearance in Mr. Fixit in 2006. He went on to appear in Wassup Rockers and Life is Ruff. Uggie got his first serious film role in 2011's Water for Elephants where he starred alongside Reese Witherspoon and Robert Pattinson. It was not, however, until 2012's The Artist that Uggie really dazzled audiences with his talents. In his memoir, Uggie will talk about life on the set of the Oscar-winning film and the role that many said should have earned him an Oscar. Uggie's memoir doesn't just hit on his career highlights, it also takes a candid look at his his private demons: overcoming a painful past as a cat-murderer and finding redemption; living with shaking syndrome; his regret at never siring any pups before being neutered. 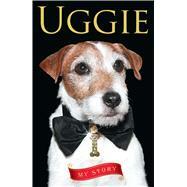 Uggie's memoir will include not just biographical information, but also advice from the dog himself. As is seen in his dazzling performance in The Artist, Uggie is an incredibly talented performer. He honed his craft while touring South America each year as part of The Incredible Dog Show, and in his memoir, he will spend several chapters sharing practical training and dieting tips that he has developed over the years.